Yesterday was AMAZING !!!!! I started snowboarding when I was a kid about 10 or so and I loved it as I have said before. Saturday was my first time back out on the hill in about 5 years. I was terrified to say the least. But this was something I wanted back in my life so badly. I emailed a group in my area that had adaptive skiing and asked if they would be willing to work with me. They were and I had my first meeting with them on Saturday where they matched me up with a volunteer to be my sighted guide down the hill. I was nervous, I did not know the person who was going to be my guide so it was hard to put that kind of trust in a stranger. We started small and went down the bunny hill a few times to let me get my bearings and figure out what was going to work best for the both of us to get me down the hill safely. After we were comfortable with each other we moved on the the chair lift and went down the “big” hills. My first run down the hill was scary. When I would catch a little speed my brain was yelling STOP NOW ! ARE YOU CRAZY ! but after a while I was able to loosen up a little and it was a great experience. I love the rush I get from snowboarding and after a few runs I wanted that speed back. I asked my guide if he minded if we picked up the speed and he told me that I could go at my pace and he would keep me safe. Well that was my green light and I flew down the hill at speeds I thought were gone for me forever ! I haven’t stopped smiling since I got home. I can not wait to get out again and keep this going. It is amazing to get something back that you thought was gone forever ! I can’t get my sight back but I can get my life back ! Slowly but surely ! Winter Blues ! and Exciting News ! Hello everyone, the weather has finally come around and it has been beautiful. Rick and I have been enjoying our walks without the frigid temperatures. We have been keeping busy with our coffee dates and walks, we also have gotten back to toastmasters after the holidays. We attended some training for toastmasters last weekend it is great to be able to walk into a room and say “Rick find chair” and he takes me to a empty chair. No more embarrassing fumbling around. He was so well behaved for the whole thing. Everyone comments about how calm and well behaved he is. He makes me so proud. He feels like one of the kids you get those proud moments when someone complements him. The first couple of weeks of January were very very cold to say the least. I have been trying to keep busy and stay positive but the winter sure gets to me. It always has, I guess you could say I get the winter blues. I get a little (maybe a lot) antsy when I am cooped up in the house for long periods of time, and by long periods of time I mean 1 or 2 days. ha ha ! I have been using some Essential Oils to try and combat this since I don’t want to be a grumpy gus about life since it is more the weather and the restrictions it can bring. Hopefully the weather can stay half decent for a while and we can try and get out as much as possible. I went and bought some new luggage today to replace the one that got trashed by the airline on the way home from Guide Dogs for the Blind. I paid a little more to get a suit case that was grey with bright orange zippers and a lime green handle. This sounds a little out there and I am sure it looks that way as well. But the reasoning for it was when I get the airline to help me grab my bag at the end of a flight I have to describe my bag. I found out that there are a lot of red suitcases last time I flew so I opted for something a little bold. Rick and I will be flying to Calgary AB to visit my sister her fiancé and my niece Flynn. I will also be meeting up with one of the people I was in class with at GDB (guide dogs) which will be nice. I am really looking forward to the trip. I also have some pretty exciting news ! I will be getting back on my snowboard on January 24th. 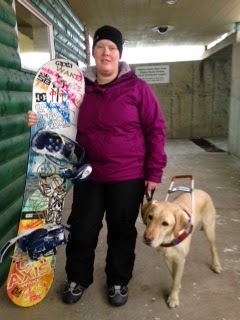 I have found a organization that will provide a sighted guide to help me get back on the slopes. I started snowboarding when I was about 10 and loved it I haven’t been snowboarding in about 5 years but have always wanted to get back on the slopes. Can’t wait, feel like a little kid with the excitement mounting. So hopefully I will be able lot get back to snowboarding with no broken bones. 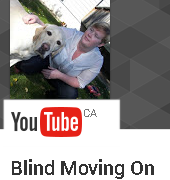 There are some myths that go along with being blind and I want to clear them up. This will make things much smoother if you ever run into someone that is blind or VI (visually impaired). Education is key, some people just don’t know how to act around someone with a disability that they know nothing about. First of all I don’t know sign language. Strangely enough that form of communication is very visual so quite difficult for the blind community to pick up. You do not have to raise your voice when speaking to me, I hear very well. Maybe when I get older you will have to raise your voice but for now my ears are good. I do not have a caregiver. I can manage quite fine out in public alone. I can also answer questions if you direct them at me. If I am out with someone and we go to a restaurant for example and the waitress says “what does she want ?” I get very upset. I can answer for myself and you can actually speak directly to me. I have a voice and am fully capable of using it. Just because I look at you when I am speaking to you does not mean I can see you. I had sight so I look in the direction of the person speaking to me. Over there, this way, that way, are too vague of directions when speaking to someone who is blind. You need to be very specific. To your right 10 feet for example. Same goes for “such and such is about this big ” ok I will take your word for it because I don’t know the approximate size of “this big”. I can use a computer and my very own cell phone all by myself. I use voice over and do quite fine on the computer and even my cell phone. I can even text all by myself. I can cook , clean, dress myself, match my clothes, put makeup on, do my own hair and tie my own shoes. I know that is surprising because that makes me sound like a able bodied person, but that is what I am. You would be amazed at what you can do without sight. Most of all I want people to know I am a human being with feelings, I am a capable adult and have ambitions and goals just like everyone else. I do things a little differently than those that are sighted but I still do them. So if you come across someone who is blind or VI treat them like you would anyone else. Ask them if they want your help before giving it and remember they are a person just like you.